"After life there is more. The end is just the beginning." What Dreams May Come is a tragedy and a love story which also includes elements of the supernatural. The story begins when Chris, played by Robin Williams, meets Annie, while on vacation in Switzerland. The two fall hopelessly in love and eventually get married. The story fast forwards to a time after they have been married for several years and have two children. Through a series of strange events, the children are riding in a car when it is hit by another vehicle, and are killed. This places a huge strain on Chris and Annie's marriage. Annie battles depression and ends up spending time in an institution. Through another strange twist of events, Chris also dies in a car accident. His death is one year after the death of their children. The story from this point follows Chris as he learns about his own fate. Not aware of his death he tries to talk to people who appear to ignore him. A strange man enters the picture who Chris recognizes as someone he knew from his past. In life, Albert was a mentor to Chris who valued his advice. The Albert in Chris's dream or surreal world, now takes on the same mentoring role. He informs Chris of his death and also shows him how to change his surroundings to suit his desires. In this new dimension, Chris meets the spirits of his children. He also learns about Annie's struggle with depression and her decision to commit suicide. Unlike himself and their children, Annie's death lands her in an unpleasant section of the dream world. Her depression keeps her trapped in a state of despair which is symbolized by the fire and brimstone surrounding where she is located. Determined to save his wife, Chris embarks on a journey into the bad regions where he must overcome his own doubts and fears. Even when he finds Annie, he still has to get through to her spirit. 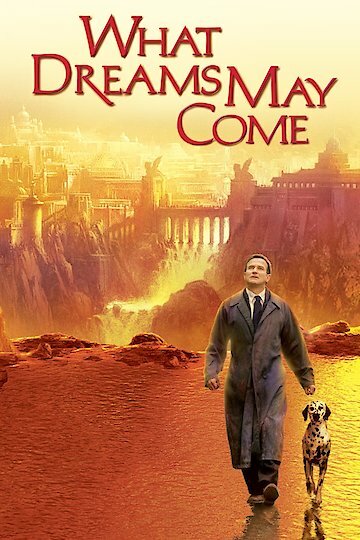 What Dreams May Come is currently available to watch free on Tubi TV and stream, download, buy on demand at Vudu, Google Play, FandangoNow, iTunes, YouTube VOD online.